For the past three years, eMathInstruction has been working to get our books available on the New York City ordering portals ShopDOE and FAMIS. 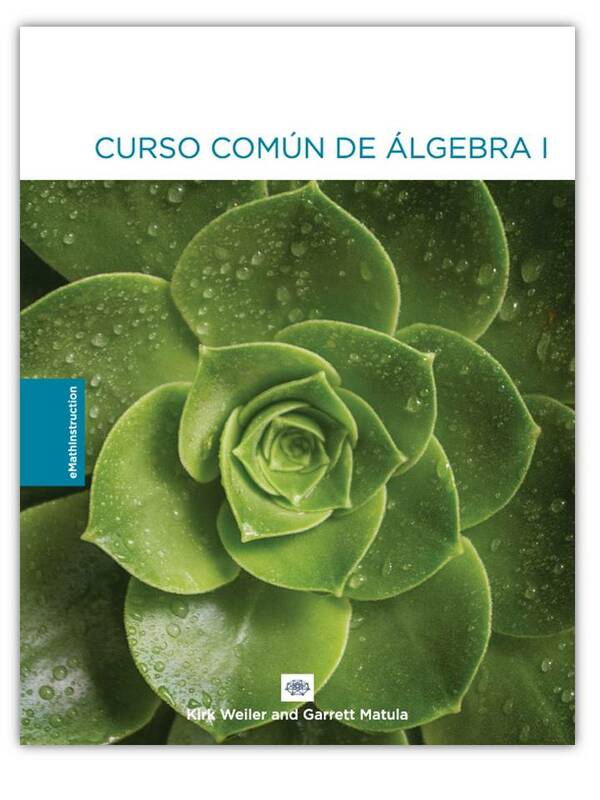 Just yesterday, we got the last of our current books, Common Core Algebra I in Spanish, up on the two sites! Visit the site to see all of the listings and get those book orders in. By mid-August books demand will start to outpace supply and we all know what happens then. Also, in the greater Northeast, it is Snowpocalypse 2017. So far about 9 inches have fallen with another 15 or so on the way. We’ve been exceptionally busy lately here at eMathInstruction. I’m going to switch things up a bit in this newsletter and give you the news first and discuss add-ons second. On the Common Core Geometry front we’ve been moving ahead nicely. We just received the first formal proof for the book. That means once we’ve done one more round of editing it will be ready to go to press. We’ve also finished the rough draft of the answer key and will continue to work on it as well. We hope to have both workbooks and answer key subscriptions available for purchase by Memorial Day weekend. In our store, it appears that both the workbooks and answer keys have been sold out when in fact they aren’t even for sale yet. But, we can create Quotes for the two products if any schools need these for next year’s budgets. Most of our time and energy now is being devoted to producing the Common Core Geometry videos. We will have full length lesson videos for each of the 95 lessons in the curriculum. We are now using a SMART Board and screen capture technology because of the more tactile approach to Common Core Geometry. During the next two months, we will be very busy recording the videos, so it may take more time to get an email response and we will likely be able to take less calls than normal. We do promise to get back to everyone who communicates with us as fast as we can. Just please be patient with us as we head into the final stages of Common Core Geometry. We also have news on the New York City front. 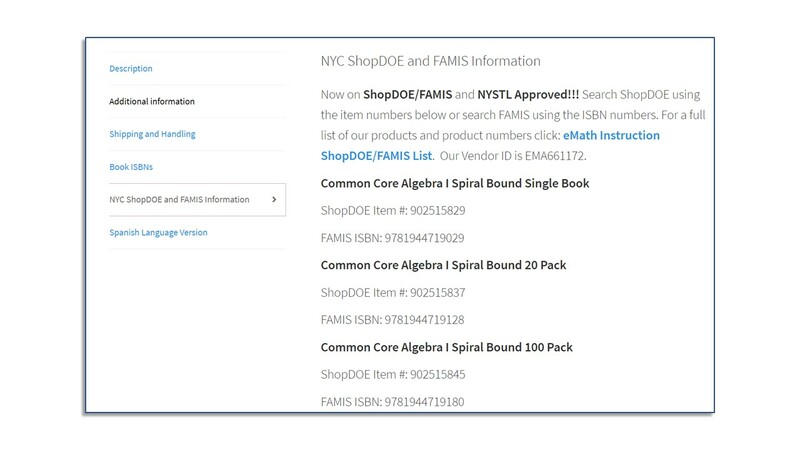 With the help of the good, and extremely patient, people in the New York City Division of Contracts and Purchasing (DCP) and Instructional Materials Review Unit (IMRU) we are very close now to having our materials listed on ShopDOE/FAMIS. They are now reviewing our books and we hope they may be listed by the end of March or early April. We are fairly certain that NYSTL approval will come shortly afterwards. But, to be honest, we are still a bit confused about that process (no great surprise). We’ve got new add-ons this month for our three main courses. For Common Core Algebra I Add-Ons we have two new additions this month. We’ve got a Unit #10 Formative Assessment Form B exam. That’s our unit on Statistics, so this is a nice beefy make-up modeled on the original. On top of that, we also spent a great deal of time this last month uploading all of our videos onto TeacherTube. We’ve heard throughout the years that some schools block YouTube. My district of Arlington never did block YouTube, or if they did they unblocked it many years ago. Anyhow, all of our links on our site will continue to be YouTube links. But for this month I created a TeacherTube Hyperlinked Table of Contents so that teachers and students can easily find the video they want. For Common Core Algebra II Add-Ons it is a similar story. First up we have the Unit 12 Formative Assessment Form B. This assessment is for our unit in Probability, so we are getting close to the end of the course with this one. Next month, when we hit Statistics, we plan to offer a Form B assessment as well as a packet of statistical simulation results that you can work with your kids on interpreting. Finally, we also have posted the TeacherTube Hyperlinked Table of Contents for that course as well. For Algebra 2 and Trigonometry Add-Ons, we continue our trend of adding on Formative Assessment for the course. We never did this when we originally created the course some nine years ago. For this month we’ve added on the Unit 12 Formative Assessment (Statistics) and the Unit 13 Formative Assessment (Sequences and Series). We’ll have to think hard about what to add-on for the April and May rounds. Perhaps reviews quizzes? We’ve now moved past the mid-winter point (Groundhog’s Day) and are heading towards spring, even though our recent blizzards don’t make it seem that way. 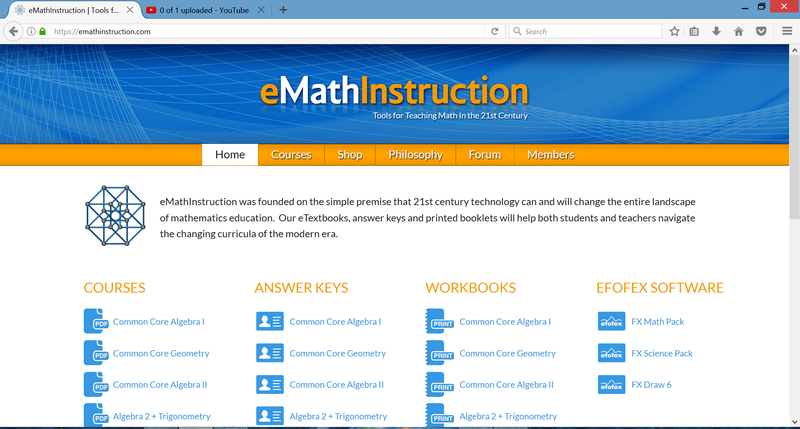 We’ve got some add-ons and some news here at eMathInstruction, so let’s get to it. 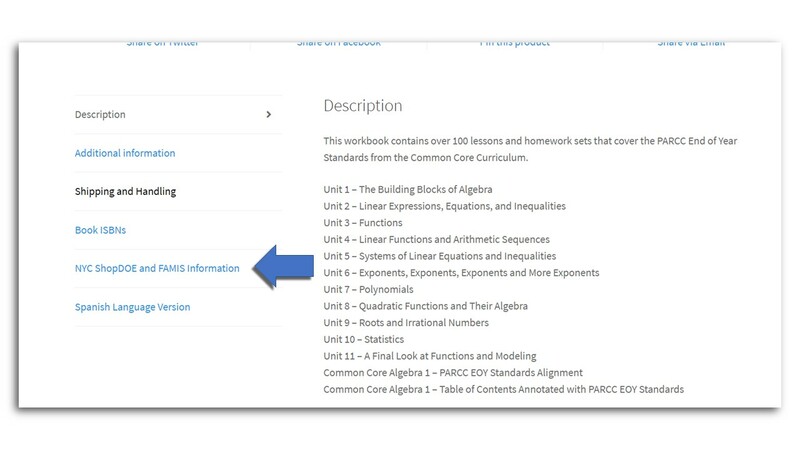 For this month’s Common Core Algebra I Add-Ons we have three new additions. We start with a worksheet that gives students extra practice simplifying square roots. This is a nice worksheet if you just feel kids need extra practice on this skill. From there we move on to a Form B Formative Assessment for Unit 9 (Roots and Irrational Numbers). Our last add-on for the month is a mid-unit quiz for Unit 10 on Statistics. We have some nice materials for our Common Core Algebra II Add-Ons this month. They are all about Unit 11 – The Circular Functions (i.e. the Trig Functions). First we bring you a mid-unit quiz that covers the first 5 lessons and will give teachers a good sense if students are understanding the basic concepts of these non-algebraic functions. Next we have a wonderful modeling activity where students use sinusoidal functions to model the length of daylight in both Poughkeepsie, New York, and Brisbane, Australia. This graphing activity uses the online graphing calculator Desmos, so there is no need for you to enter data by hand or into any calculators. Students just click on a link and are taken immediately to the data. Finally, we have a Form B Formative Assessment for Unit 11. For the Algebra 2 and Trigonometry Add-Ons, we bring two solid Formative Unit Assessments. 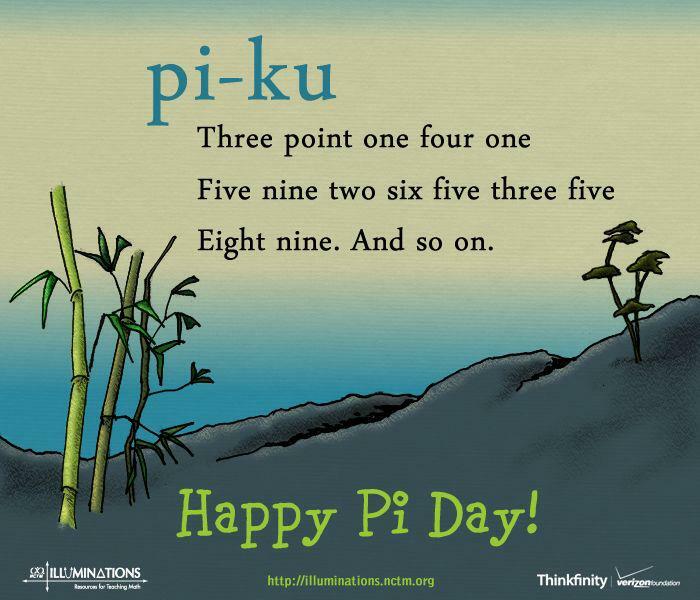 The first is for Unit 10 – Exponential and Logarithmic Functions. This is a challenging assessment that will really let teachers see how much students have learned about these challenging topics. We then bring you a Formative Assessment for Unit 11 – Probability. Students will be challenged to deal with combinations, permutations, and binomial probability. Fun! Besides add-ons, we have news on other fronts. We have experienced a great deal of growth in our website traffic in the last year. So, in the next week we will be switching hosting services to one that can carry all of the traffic easily. That might cause a few hours of our site being out, but we will attempt to do that in the overnight hours on some weekend night when hopefully no one is actually using our site. Common Core Geometry is coming along nicely. We are done with our first draft of the answer key, which also means we are done with our second round of editing on the book itself. 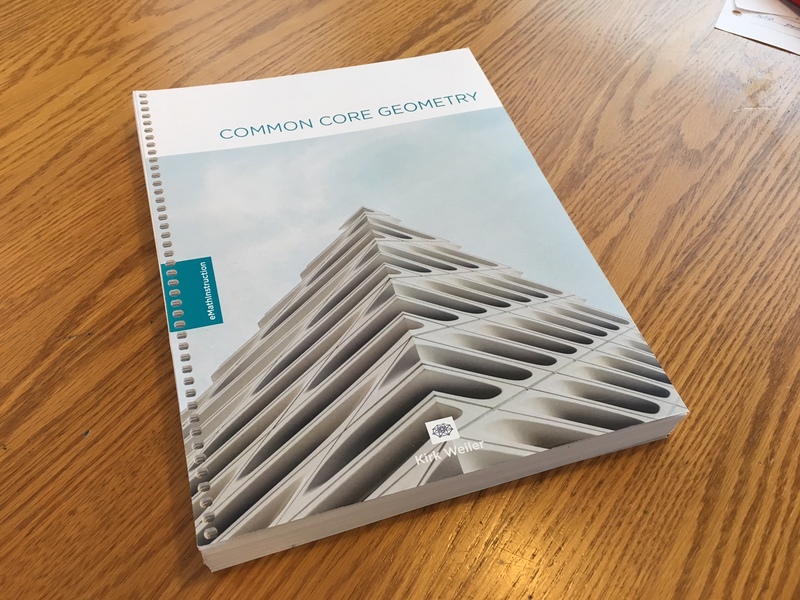 We plan to have Common Core Geometry workbooks and answer key subscriptions ready for quote in mid-March and ready for sale around Memorial Day. We have just begun to work on the videos and will begin to release them as we get them done and edited. We may be taking our time on these and because of that may not have the QR codes on the first edition of our workbooks. But, if that is the case, we will certainly publish a hyperlinked table of contents and will always have the links handy on our website. We continue to work on a Spanish language version of Common Core Algebra I. We believe we will be ready to sell this for the 2017-2018 school year (it is done in its first draft). Well, that’s about it for now. As always, contact us if you have suggestions for add-ons or if you have any questions. 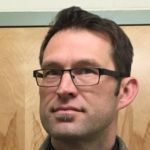 You can always reach me at: Kirk@emathinstruction.com. We continue to send out answer key CDs each day as soon as we get orders for them or that include them. The workbooks, those have more of a lag time. My great printers at NetPublications in Poughkeepsie, New York, are working tirelessly to get these things printed, packaged, and out the door. 1. If your district got me the order before August 15th, then the books are shipping today and should get to you by tomorrow (August 26th) or Thursday (August 27th). 2. If your district got me an order for workbooks after the 15th, but before today, those start to go into production soon. They will ship on or before 9/9/2014, but that still leaves you at least the first week without the books. Sorry about that! Consider copying the first two weeks from this site. Email me at emathinstruction@gmail.com if you have questions about the status of your order. I’ll always give you the best information that I have.